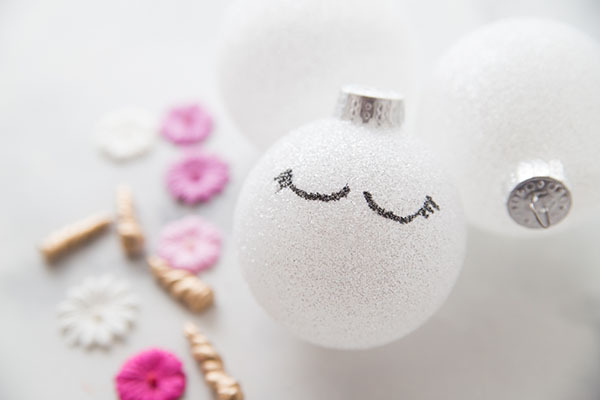 If you’re looking for some simple and fun Christmas ornament ideas this year, we have so many to share with you! 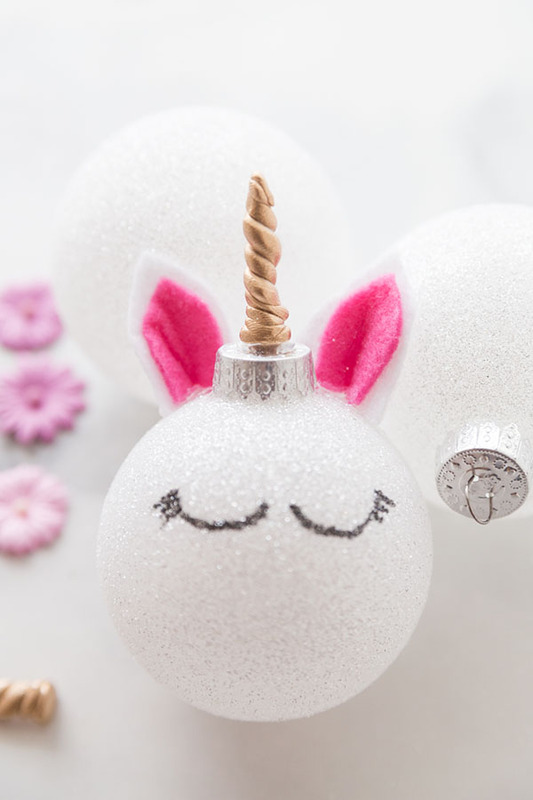 This one is perfect to make for the unicorn fan in your family. 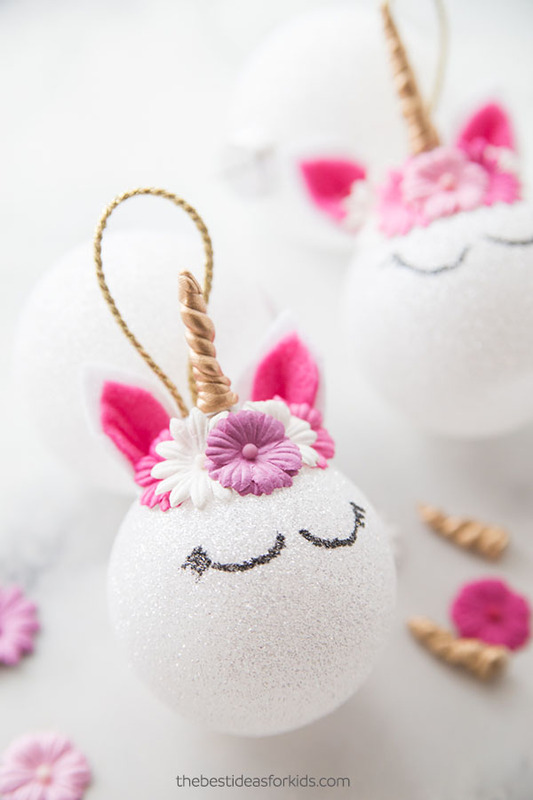 These easy DIY unicorn ornaments will make the perfect gifts for Christmas. 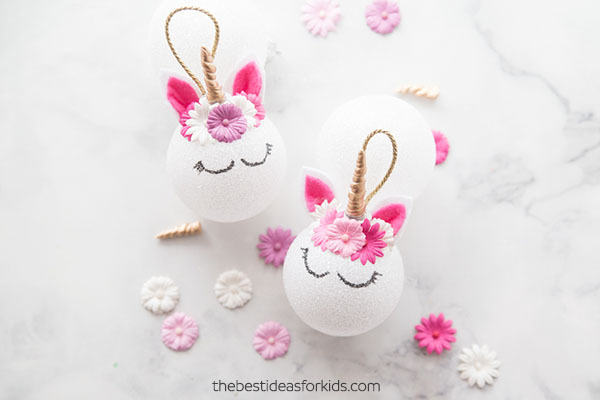 Or simply make them with your unicorn fan in the house to hang on the Christmas tree as a fun afternoon craft! 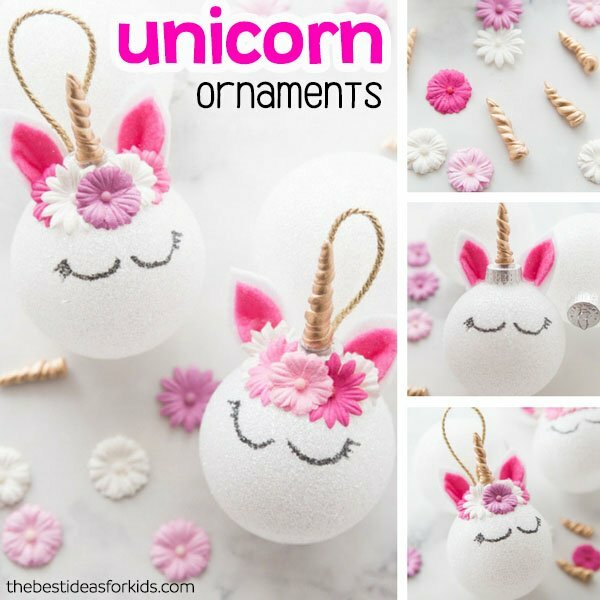 These unicorn Christmas ornaments are so fun to make! 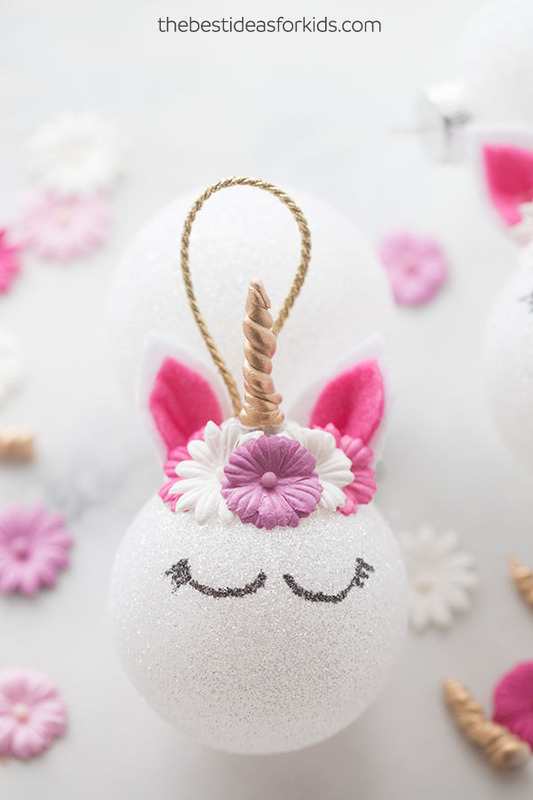 We were inspired to make them when we saw these unicorn ornaments that you can purchase from Etsy. The cost of them is over $40 though, and we were able to make a whole pack of ornaments for under this (and could be less if you already have some of the supplies on hand). We had a lot of fun making the horn and working with the clay for these. 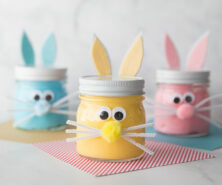 You could make these for a unicorn party or simply have a fun unicorn-themed afternoon and make them along with our popular unicorn slime. 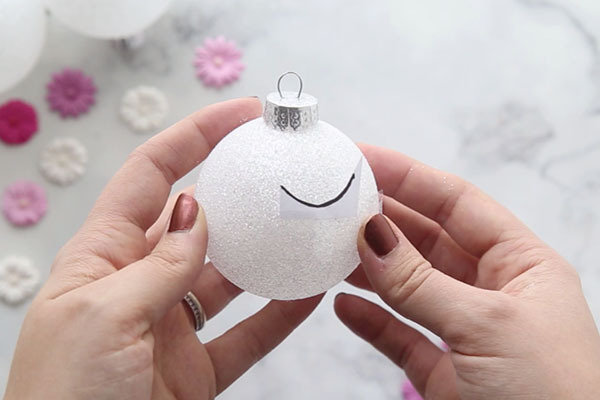 This ornament craft does require the use of hot glue – so we recommend that adults do this part or you can find low temperature hot glue and if age-appropriate (always read and follow the label of products) then your older kids can help out too. 1. First make your horn by cutting off two small pieces from your clay block. Roll the clay so that one end is smaller than the other. You’ll want one end of the clay to be thicker than the other so that when you roll together the bottom of the horn is thicker than the top. 2. 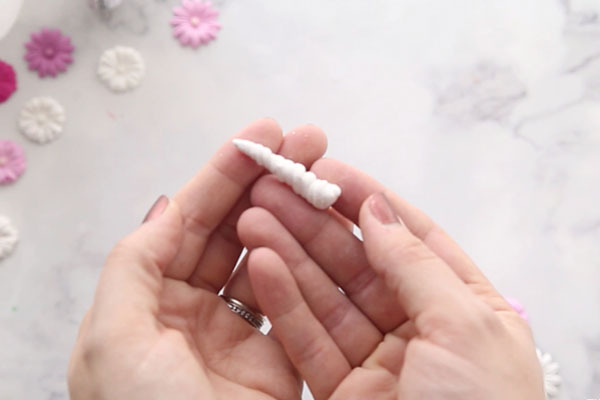 Then twist your two pieces together and keep twisting to get them closer together and a bit fatter so that it looks like a unicorn horn. When you’re happy with the size you can cut off the end so that it’s about 4cm long. You can make a few of the horns in case you prefer one or the other once they are painted. We then put in an oven save dish standing up to bake according to package directions (our package was 275 degrees F for 15 minutes). Adults should do the baking part. 3. 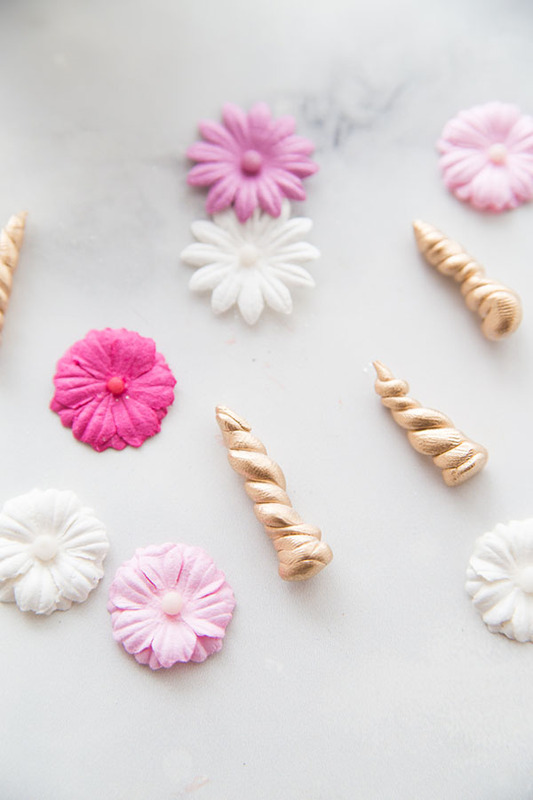 Once your baking is done and cool you can now spray paint your horns gold. Adults again will need to do this part and always read and follow directions of your spray paint used. Here are the finished horns – aren’t they pretty? 4. Now draw a sample of your eyes on white cardstock to use for tracing. This way both of your eye sizes will be the same. Cut out the template you create on cardstock to use as a reference. Using some tape, tape down your template to the ornament and use your oil based pen to draw the eyes. The reason you want to use an oil based pen over a regular sharpie is that it will be more durable on glass ornaments. – Don’t press too hard or it may get too thick. 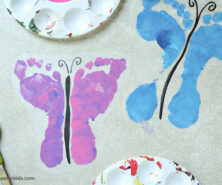 – Try to draw all in one motion so the paint doesn’t make a spot. It may help to practice a few times beforehand. Now draw some swoop eyelashes free handed (larger on the outside and then smaller as you go in for 3 lashes on each side). 5. Now cut out your ear pieces drawing a template on your cardstock. 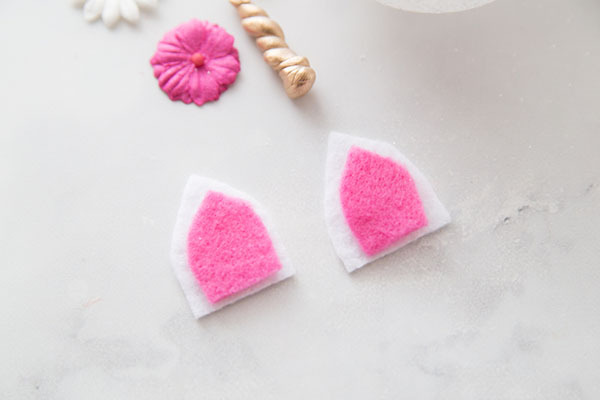 You want both ear sizes to be the same so you can draw a smaller inside ear portion with your pink felt and a larger ear portion for your white felt. Use some glue to glue the pieces together. Make a slit on the bottom and then glue the sides from the bottom of the slit together so the ears bend in. Now glue the ears to the ornament slightly behind where the horn is placed. 6. Now glue your horn to the top of your ornament. 7. 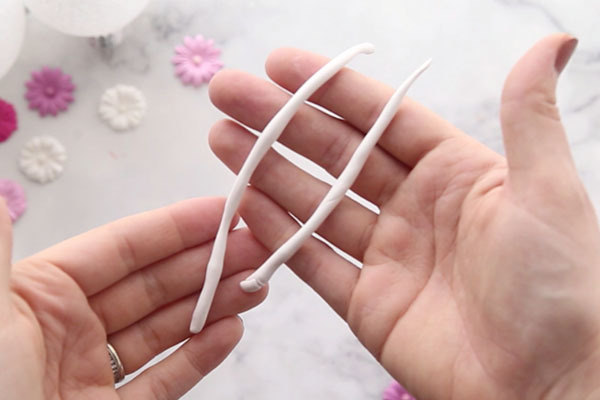 Now glue on your flowers using a mix of pink and white on the sides. Be sure to cover the front of the horn/ornament topper with a middle flower. 8. Now add your gold twine to your ornament by wrapping and tying around the ornament top or gluing to the back of the ornament. And that’s it… kids who love unicorns will absolutely love to receive these as gifts or help you create these as gifts for others! 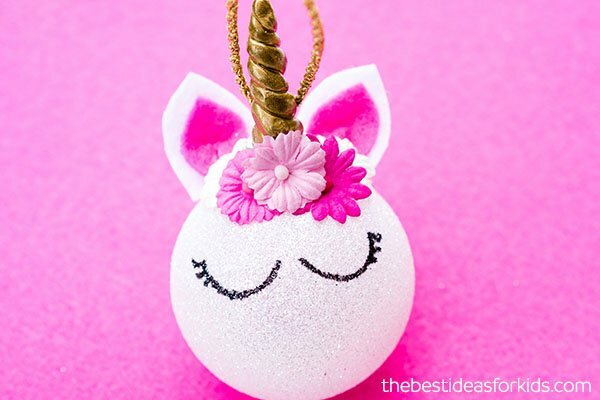 Want more Unicorn Ideas? 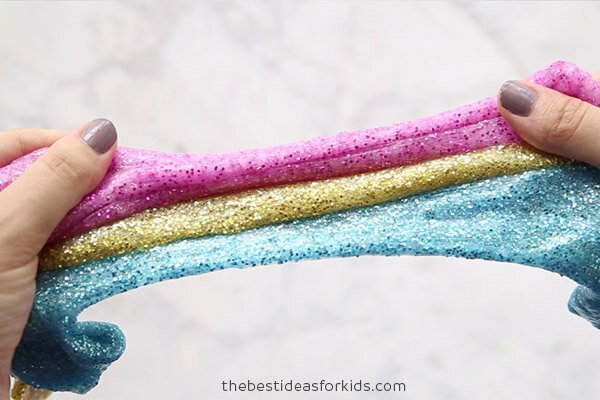 Check out this easy 3 ingredient Unicorn Slime! So fun to make and play with! 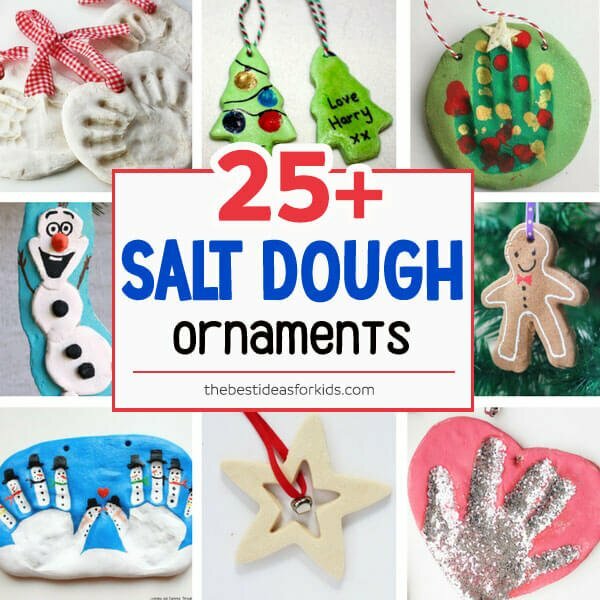 And for other beautiful ornament ideas – see these 25+ Salt Dough Ornament Ideas. 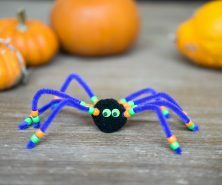 I’ll make them for the Christmas Tree this year! My daugther Cydmarie wanted our Christmas Tree decorated with unicorns past Christmas 2017 but she died on October 19 2017. We didn’t had a Christmas tree on 2017 cause I was depressed after she died. Nut now I will please her for what she wanted! LOVE YOU MY DIVA!❤???? We hope you have fun making them! Sorry for your loss. October 19th is my birthday!!! I’m having a unicorn birthday party to celebrate my 42nd Birthday with all the kids in my life and I will think about your daughter Cydmarie and hope she’s watching from heaven!